On Thursday 3 June nearly one hundred people attended the first Lunchtime Live! summer recital of 2010. The series of weekly recitals on Thursdays at 1:10pm, entitled “The Queen of Instruments”, features seven of the finest women organists working in Britain today. 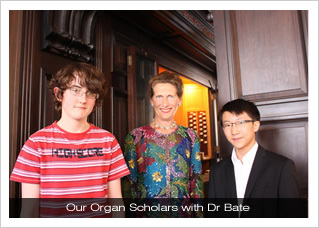 The series Patron, Dr Jennifer Bate OBE, gave the opening recital performing a spell-binding programme of works including Liszt’s monumental “Fantasia and Fugue on BACH”, two works by Robert Schumann (who celebrates his 200th birthday this month) and her own “Introduction and Variations on an Old French Carol”. Each of our recitalists will perform a work by a female composer – Jennifer Bate, Judith Bingham, Pamela Decker, Jeanne Demessieux, Joanna Marsh, Elo Masing, Marjorie Merryman, Florence Beatrice Price and Clara Schumann feature. Full programmes details can be found by clicking here. 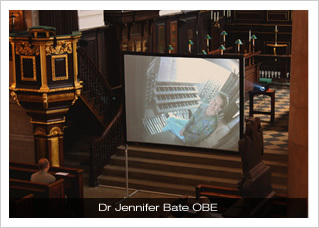 The recitals feature our new Video Projection System (pictured here) which has been supplied by www.orchid-projectors.co.uk and enables an excellent view of the performer’s dexterity on key and pedal boards. Ann Elise Smoot’s recital on Thursday 17 June will be given in memory of Mary Woodward, Honorary President of the Northampton and District Organists’ Association, who died on 24 May and who was, until her death, one of Ann Elise’s students. Mary was influential in the musical life of St Peter’s Church in Brackley where her husband, The Reverend Canon Peter Woodward, was Vicar.